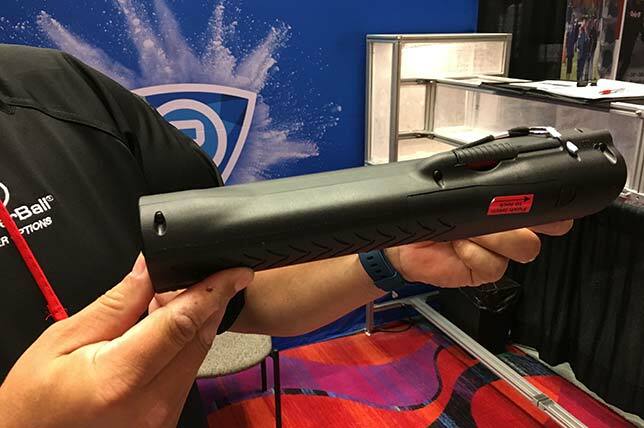 At the National Association of School Resource Officers annual conference, a thousand-plus attendees made up primarily of school-based law enforcement officers, school administrators and school security and safety professionals hit the tradeshow aisles to see the latest in classroom door lockdown technology, body cameras and radio systems. While we don't all need knapsack armor panels, here are six technologies that may find a home on your campus, several of which are free for educators. Alertus Technologies, which works with schools to integrate their existing emergency mass notification systems into a "one-button" operation, talked up free availability of its "Alertus Desktop Donation Initiative." Under this program schools — both K-12 and post-secondary — gain an enterprise-wide perpetual license of the company's desktop notification system. The purpose, according to Miles Harriger, who runs higher education sales, is to give schools a free way to communicate in an emergency. The desktop system can take over the full-screen, run in "ticker mode" at the top of the screen, deliver audible alerts and provide pop-up or quarter-screen mode. The donation includes the core Alertus server software, an activation console program and unlimited use of the desktop notification client software, which runs on both PCs and Macs. K-12 schools that have taken advantage of the program include Payson Unified School District in Arizona and Burke County Public Schools in North Carolina. Ident-A-Kid showed off its latest version of software for visitor management. The application is intended to automate the process of approving daily entry of staff, students, volunteers and other visitors. They're pre-entered into the system, which checks their ID against a sexual offender list and a school-created "banned persons list," before granting them access to the campus. According to Emily Fellouzis, director of development and sales, most schools run the program as a stand-alone kiosk; the remainder have an attendant stationed at the front door to grant access after performing an ID check. When somebody should be denied entry, a notification is sent via email, text message and desktop alert. The latest version, released in January 2018, was converted to a modern web-based interface. "Schools don't always have the best internet," she said. Now they can run "the entire system offline or, if they need to, on a mobile device with an administrator moving around the school. Everything is reportable from the cloud." She said the new release also added face detection, touch-screen compatibility and an enhanced "no-go" feature that allows for the school to upload pictures and documents (such as court orders) to help the person reviewing the alert "make a more informed decision." Innocorp demonstrated its newest addition to the Fatal Vision simulation goggles line. FatalVision Drowsy and Distracted Goggles flashes from a clear view to a black view for 4.6 seconds at a time to give wearers the experience of drowsy or distracted driving. According to President and CEO, Michael Aguilar, that duration has been proven in research to be the average amount of time a person takes his or her eyes off the road to check a text. Innocorp's FatalVision Drowsy and Distracted Goggles are intended to simulate the experience of looking away from the road for seconds at a time. The company's primary market is law enforcement, which buys its products to take into school and community events to enable participants to experience "simulated impairment." For example, they'll have users put on Fatal Vision Alcohol Impairment Goggles and have them try to "walk the line," said Aguilar. 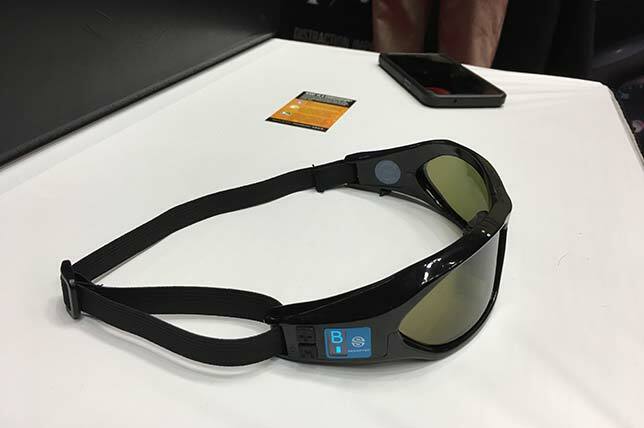 The company provides varying levels of simulated intoxication and makes goggles available in clear or shaded lenses to simulate daytime and nighttime impairment. A marijuana edition simulates "the distorted processing of visual information, loss of motor coordination, and slowed decision making and reaction time resulting from recreational marijuana use." For schools that don't know where to start in beefing up their security, a service currently funded by the U.S. Department of Education Office of Safe and Healthy Students, will visit schools to help them set up and implement emergency operations plans. The Readiness and Emergency Management for Schools (REMS) Technical Assistance Center works with schools, districts, state education agencies and other entities to provide on-site training in a number of safety areas, including a day-long "School Behavioral Threat Assessments." The TA center provides the trainers, the materials and even the online registration system and marketing flyer for distributing in your district. The cost: Zero. The website also offers planning tools, web-based training, emergency management tools and a community of practice that allows closed groups of people to gather online for specific projects. Another set of free resources is provided by the Digital Futures Initiative, which has developed programs with lessons in digital citizenship, teen relationships, substance use and districted driving, as well parent academies and elementary-specific instruction. This instruction has been picked up by SROs who get certified to deliver the training in their own schools and districts. Three years ago, Bruce Boroski, a high school SRO for the Loveland, CO police department, proposed DFI training to his school board, which approved adoption. "There are three high schools in Loveland. We're all creating our own PowerPoints. I don't have time to update [the training] every year. If I'm in a classroom and I show them a video that's four years old, I'm going to lose them," he explains. "Every year DFI updates the curriculum for us. It saves me time. Plus, in our city we're teaching the same information in every school, all the way from sixth grade through high school." Finally, if you're concerned about the prospect of arming teachers, PepperBall has a non-lethal alternative. About a month ago, the company entered the school market to sell its launchers, which are about the size of a heavy-duty metal flashlight. Powered by compressed CO2 cartridges, they launch "PepperBall" rounds at 275 feet per second — akin to a high-end paintball gun. The projectiles can be made of multiple substances. Some are designed to break windows to allow for escape; others contain PAVA spray, a kind of pepper spray; others are simply hard enough to hurt somebody. The PepperBall launcher is intended to be a non-lethal weapon to help teachers buy enough time to get their students to safety. "We never have to directly engage with somebody. This is what we call 'area denial,'" said company representative Erik Leslie. "What it does is impact an individual and deliver pain compliance." For example, the pepper-spray ball could be shot at a wall to create a cloud of pepper spray and prevent somebody from coming into the space. Or it could be directed at the floor under a door to prevent somebody from entering the classroom. The weapon comes in a lockbox with a two-key system that can be mounted to the side of a desk. "We're just trying to buy time for that first responder to get on scene," noted Leslie. "And that's what these will do — they'll buy time." Currently, a school district York, PA has undertaken a test with its teachers and SROs. Recently, the superintendent of that district, Andrea Berry, had this to say in a press release. "School safety is a top priority, and while we can't discount safety, we have constraints and must make sure that we we're fiscally responsible when looking for safety options. The PepperBall Protect Program is effective and affordable. A big part of our decision-making process was the thorough training that the company provided, which made everyone feel comfortable using this life-saving device. When we deployed these in our schools, our safety officers breathed a big sigh of relief."